"This is a tangy variation of an old recipe. Blueberry pound cake with the added spark of lemon. I love it and so do my kids." Preheat the oven to 350 degrees F (175 degrees C). Grease and flour a 10 inch Bundt pan. In a large bowl, cream together the butter and sugar until light and fluffy. Beat in the eggs one at a time, then stir in the lemon extract. Combine the flour, baking powder, and lemon zest; stir into the batter alternating with the milk. I like to use a spatula and stir by hand, mixing just until blended so the batter is not over mixed. Be sure to scrape the bottom and sides of the bowl often. Fold in the blueberries. Spoon the batter into the prepared pan. Bake for 1 hour in the preheated oven, or until a toothpick inserted into the center comes out clean. Let cool in the pan for at least 10 minutes, then invert onto a wire rack to cool completely. 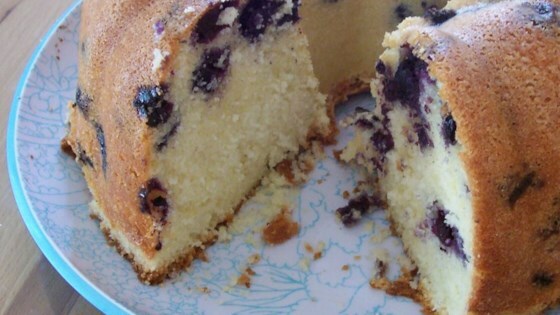 If you use 1/4 cup of the flour in this recipe and coat the blueberries before you put them in cake batter, the blueberries will not sink to the bottom.